Prime Minister Ariel Sharon is now tentatively set to bring his "new plan" for withdrawing IDF troops from the Gaza Strip and uprooting Israeli settlements there and in Samaria to the cabinet for its approval next Sunday. 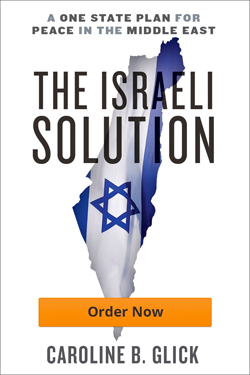 The new plan, we are told, is simply an incremental variation on Sharon's previous plan which was overwhelmingly rejected by Likud party members at the beginning of the month. The new plan calls for IDF withdrawal from Gaza and uprooting of Israeli communities in three stages with each distinct stage coming before the cabinet for approval before implementation. Aside from this, the plan also contains two additional novelties. The first is a call for amending the 1979 peace treaty with Egypt to enable the Egyptian military, as opposed to Egyptian border guards to deploy along the Egyptian side of the border with Gaza. The second new component of the plan that the prime minister's office is currently floating is the deployment of an international force into Gaza. From a domestic standpoint, what stands out about the new plan is its author. Whereas authorship of the plan to unilaterally withdraw from Gaza belonged to former Labor party leader Amram Mitzna, the new plan comes straight from Yossi Beilin's drawing board. In crafting the Oslo plan, Beilin came up with the idea of establishing a PLO state in Judea, Samaria, Gaza and Jerusalem on an incremental basis. So it was that Israel first removed its troops from Gaza and Jericho and only later from the other major cities and villages in Judea and Samaria. As well, over the past two years, Beilin has been pushing the idea of bringing foreign forces, including Arab armies, into the territories together with his American supporter, former US ambassador Martin Indyk. The idea of amending the peace treaty with Egypt is bizarre on the face of it. The current IDF operation in Rafah was necessitated by Egypt's abject refusal or failure to prevent weapons smuggling into Gaza through subterranean tunnels burrowed across the Egypt-Gaza border. If Egypt were upholding its commitments to Israel in the peace treaty, it would have been actively and continuously working to prevent weapons flow from its territory to Gaza. It has not. It is argued that an amendment of the 1979 treaty to allow regular Egyptian military units to deploy along the border will empower Egypt to take action against the weapons smugglers. This is ridiculous. As it stands the treaty enables Egyptian border guards to deploy along the border and places no restrictions on the size of such a force. These border guards can be armed with assault rifles for the dispatch of their duties and there is no reason why such armaments would be insufficient for stemming the arms trafficking. More importantly, given the virulence of hatred of Israel in Egypt – hatred that is encouraged by the Egyptian government – the long term implications of an Israeli move to allow Egypt to deploy regular army forces along the border could be disastrous. Indeed, rather than look to Egypt for a solution to a problem it is largely responsible for creating, Israel should be leading a diplomatic campaign against Egypt to force it to act responsibly. Up until this week when the idea of bringing foreign troops into Gaza in the framework of an Israeli withdrawal was first introduced by the prime minister's office, it had been the policy of all Israeli governments to reject out of hand any thought of bringing in foreign troops aside perhaps from US forces. This has been Israel's consistent policy because our successive governments have understood that the hostility towards Israel in the international community – from the Arab world to the EU to the UN to the international human rights organizations – is so inbred that any foreign troop presence in the area would automatically harm Israel's national interest of ensuring the security of its citizens and the inviolability of its territory. The understanding was that foreign troops in Judea, Samaria and Gaza would not work to bring order and quell terrorism but would rather protect terrorists operating in these areas from Israeli military operations. This view was based not only on the knee-jerk anti-Israel positions taken by these governments and international organizations but also on Israel's experience with UN forces in southern Lebanon. There UN peacekeepers allowed themselves to be exploited, repeatedly and consistently by Hizbullah and other terrorist organizations that used UN cover to commit terrorist attacks against Israel. It should not be forgotten that almost a year after IDF soldiers Benny Avraham, Omar Sawayid and Adi Avitan were kidnapped by Hizbullah in October 2000, Israel discovered that the UN had been hiding information about their abduction. Arguably in contravention of international law, the UN had hidden from the IDF videotapes it had of the soldiers' abduction as well as operational and personal effects of the soldiers. The Hizbullah terrorists who carried out the kidnapping traveled in a vehicle with UN plates and a UN flag. UN forces in Lebanon who found the vehicle while its engine was still running, removed the equipment from it, including several articles that were stained with blood. After the information was revealed, the UN still insisted that Israel could not analyze the blood samples but rather that the analysis would have to be done by the World Health Organization. Until Israel discovered this information the government and the IDF were operating under the assumption that the soldiers were still alive. Early access to the information could have given the IDF the opportunity to discover that in fact the soldiers were murdered by their kidnappers. The rationale for the current plan of bringing foreign troops into Gaza is that the prime minister and his advisors are attempting to find a way to negotiate the Gaza withdrawal with someone. In the absence of a responsible Palestinian interlocutor, the thinking goes, Israel must invent a partner with which it can implement the withdrawal plan from Gaza. Indeed, although the full-blown campaign launched by the Israeli media to delegitimize the results of the Likud vote has resulted in a majority of public support now for a withdrawal from Gaza, the public is still evenly split as to whether Israel can leave Gaza without handing over its responsibility for security to a responsible party. The hope no doubt is that if the international community has an active role to play in Sharon's retreat plan, it will have a stake in the plan's success. Yet the international community's reaction to this week's IDF operation in Rafah has shown unequivocally that this hope is based on absolutely nothing. Even before Israel committed its troops to Rafah, Amnesty International had already accused Israel of committing war crimes in destroying houses in Rafah along the border. Never mind that the claim has no basis whatsoever in international law. States have the lawful right to view as military targets any structure that is used to conduct military operations against them. And these houses were used specifically for that purpose. Amnesty's condemnation came without the organization even bothering to check the facts. Just as was the case of the battle in Jenin refugee camp in April 2002, Amnesty reached its conclusion without launching an inquiry. Amnesty's libelous attack on Israel was immediately picked up by media organizations worldwide as well as by the UN and the EU. These then repeated the condemnation of Israel verbatim. On Tuesday, no greater moral authority than the Church of Sweden called for its members to wage an economic boycott against Israel. wn people that have shown them conclusively that the Palestinian Authority is a terrorist organization and that its method of fighting Israel while hiding behind civilians is by its very nature a war crime. They know everything, but they do not care. They believe that their national and institutional interests are best served by condemning Israel and embracing Palestinian war crimes as justified. In an attempt to get the foreign media to report what is actually happening on the ground in Gaza, the IDF's spokesman's unit pleaded with foreign news agencies to join IDF forces in their operations and see for themselves. By mid-week, the IDF had to admit that the attempt was an abject failure. Almost no one took them up on the offer. The foreign media is not interested in showing the truth. They simply want to criminalize Israel. The most abject and obnoxious instance of this is the reaction to the IDF's apparent inadvertent killing of five Palestinian gunmen and two teenagers during a PA organized march towards IDF forces stationed in Rafah on Wednesday. Without bothering to check the facts, just as was the case in Jenin, the international media gushingly reported that IDF troops had "massacred" Palestinian civilians in a peaceful march in Gaza. The Palestinian press releases on the matter were indulgently quoted as fact as news organization after new organization dismissed the IDF's explanations as lies. In a matter of hours, the UN Security Council passed a resolution condemning Israel. The US — due no doubt to its current self-destructive wooing of the UN and France in Iraq — declined to veto the decision. The sad and terrible thing about Sharon's newest plan is that he actually thinks he needs a plan in the first place. If our experience over the past 11 years has taught us anything, it is that no matter what Israel proposes to do in the interest of peace and Palestinian independence, it is always blamed when the Palestinians continue to make war against us – regardless of the barbarism of their actions. The simple truth of the matter was made clear this week by COS Lt. Gen. Moshe Ya'alon. Speaking of the military necessity of the operation in Gaza to the Knesset, Ya'alon said, "Only the IDF can secure Gaza." No plan, no matter how new can change this basic truth. Originaly published in The Jerusalem Post.